Rejoice! Curtis's NEW 144 Volt Controller is NOW AVAILABLE! 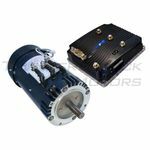 Our electric drive systems are sold as a kit that includes an HPEVS motor, Curtis controller, Spyglass display. The Spyglass (model 840) displays rpm, controller/motor temperature, volts, and amps. Each Curtis controller is pre-programmed for your unique application. These systems do not require an additional inverter and use a DC battery voltage input. The AC-20 systems have a very high peak power to weight ratio making them our go-to choice for racing vehicles.